For those looking to reclaim their zen this year—or those bravely seeking it out for the first time—there may be no better time to start: The holiday madness is finally through and the flip of the calendar allows the opportunity to focus on fresh new starts. But if 2019 is already giving you agita, you may have your location to blame. Job search website Zippia recently compiled a list of the nation’s top 10 most stressed-out states, with the highest rankers landing all over the map. To calculate the anxiety-inducing numbers, Zippia factored in a number of considerations, including unemployment rates, population density, and home price-to-income ratio—all of which are undoubtedly responsible for raising blood pressures nationwide. But some of the biggest contributing factors to stress in a state were found on the road. Average commute time and the number of uninsured residents were two of the biggest predictors in statewide stress levels, Zippia found. We here at DMV.ORG can understand why. Driving in general—let alone in congestion… let alone in congestion on your way to work—takes a huge toll not just on your mental state but your physical wellbeing, which only serves to perpetuate the cycle of stress. And doing all that driving while uninsured is not only illegal—a stressor in and of itself—but puts you at the mercy of the terrifying (and potentially expensive) unknown, not to mention the whim of other drivers who may be piloting their vehicles less safely than you. Carrying all that pressure into the driver’s seat isn’t just bad for your health, it’s bad for your wallet. Studies have shown that bad moods behind the wheel correlate with poor fuel efficiency, making your rides even more costly—and caustic. Luckily, there are some ways to mitigate these issues (Take a deep breath. Buy the insurance. ), but you may want to keep reading to see if your location calls for an especially strong dose of namaste. Driving to work is not such a sweet-smelling proposition in the Magnolia State. Mississippi was already crowned by Zippia as the most dangerous state to commute in the nation, thanks to a perpetually high roadway fatality rate. And those getting into accidents there are much more likely to worry about how to pay for it. According to the latest numbers from the Insurance Research Council, the state is the nation’s 2nd-highest for uninsured drivers: 23.7% of motorists go without car insurance policies. Virginia is not for lovers of downtime. The state boasts one of the worst average commute times in the country, with drivers typically stuck in their vehicles for 28.6 minutes 1 way. The problem is so notoriously bad that last year, Virginia drivers were subjected to an experiment with demand-based tolls—perpetuated by the state’s Department of Transportation as an attempt to change driver attitudes and help clear the roads. The drivers of stress in the Tar Heel State have less to do with on-the-road difficulties. According to Zippia, residents there suffer under the weight of a high unemployment rate, making commute times less worrisome, but hugely amplifying financial anxieties. Lack of insurance—of the medical variety—is also a large factor that got the state placed so high on the list. 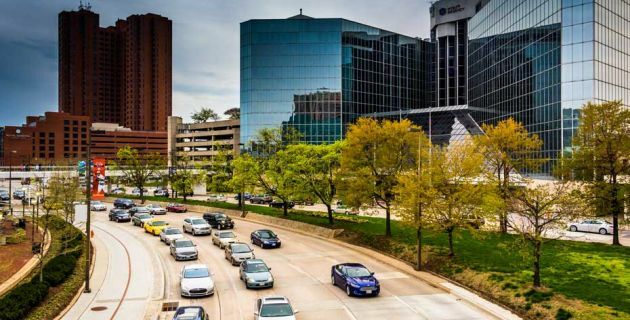 Traffic in Maryland is thanks, in large part, to many residents' commute into Washington D.C.
Washington, D.C. is not exactly known as a bedroom community, but someone’s gotta keep the country running. Commute times in the Old Line State are even worse than their southern neighbor’s, topping out at just over a half-hour each way. All told, Maryland drivers spend about 47 hours each year idling in traffic—enough to make even the stress-hardened politician develop a nail-biting habit. Louisiana residents may not take as long to get to work, but once they’re there, they’re locked in for hours. According to Zippia, the state clocks one of the longest average workweeks in the nation—possibly thanks to all the famously late hours of its most-frequented establishments. No wonder Louisiana lets it all out at an epic party each year. It may come as no surprise that the City That Never Sleeps has some issues with stress, but in a place with so many public transit options, a big source of that anxiety may be unexpected: commute times. New York City has the longest average commute in the nation, with a typical 1-way trip clocking in at no less than 36 minutes. Those braving the busy streets behind the wheel are also doomed to an average of 89.4 hours stuck in traffic congestion annually, many of which are likely spent watching the city’s notoriously lightning-fast pedestrians zip on by. 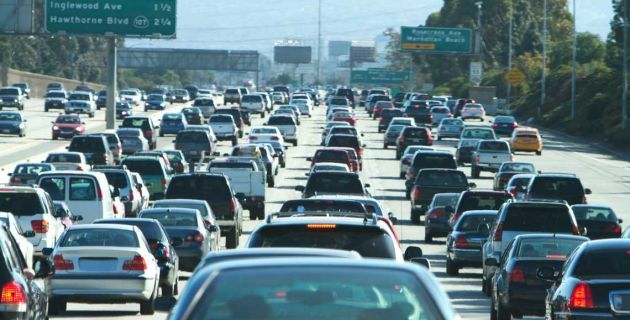 Several parts along the long state of California are infamous for rush-hour gridlock. California may be known for its laid-back lifestyle, but lurking just underneath that peaceful glow is an undeniable ball of nerves. The state is an exceptionally expensive one to live in, which is why Zippia ranked it so high on the list. But Californians also have a notoriously terrible traffic congestion problem, with the state touting an average 1-way commute time of 28.9 minutes. And among that sea of motorists is a fair share of uninsured drivers, with the Golden State recording an insurance-free driver rate of 15.2%. The Sunshine State may be a popular retirement destination, but those looking for some peace in their golden years may want to think again. Florida ranks number 1 in the nation for uninsured drivers, with 26.7%—or nearly 1 in 3—motorists there hitting the road without credentials. According to Zippia, another leading stress factor is a low rate of health insurance, making the state a top place to not visit if you plan on driving or getting sick. It’s not all peaches and cream for residents of the southern state. Zippia placed Georgia so high on its list thanks to a number of discouraging factors, including high rates of unemployment and low rates of health insurance. But residents living in the Atlanta metropolitan area must also deal with grating traffic, spending an average 72 hours each year stuck in a venerable sea of cars. It's no surprise to anyone that overcrowded, overpriced New Jersey topped this list. Is it any surprise that the most famously belligerent state in the nation is dealing with the highest anxiety? New Jerseyans have any number of stressors coming their way on a daily basis: The state is exceptionally overcrowded, overworked, and overpriced. And not to mention, in constant need of defending itself against accusations of belligerency. All of these issues manifest on its roads as well, including its famous dog-eat-dog highways. Garden Staters spend an average of 31.2 minutes on their way to—or home from—work, which, according to slightly less official counts, roughly calculates to 4 middle fingers and 2 car honks per minute en route. And should something accidental happen on these aggressive work-bound trips, there’s less likelihood that an insurance company will pick up the tab. 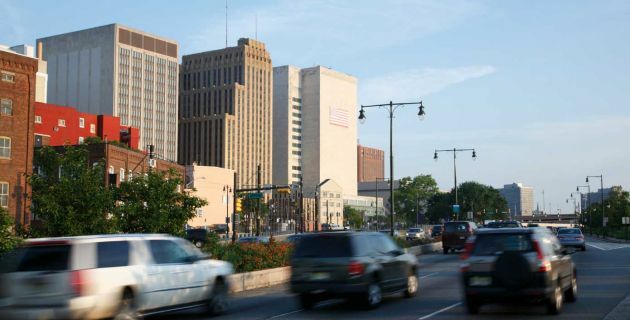 New Jersey recorded a 14.9% uninsured motorist rate in the latest numbers, which was 14th worst in the nation. So next time you see a Garden State license plate, proceed with caution and compassion: The person behind the wheel may be dealing with more than you know.